It's true, there's no floor-covering more ideal for ashtma/allergy guys and dolls (no matter how old or young) than natural wooden flooring. Is your home improvement adding money? Trying to add value with a renovation project needs careful consideration as it is easy to spend more on renovations than any gain in house price you may make. Before increasing your borrowing to fund renovation plans you should decide whether your main aim is to add value to the property that you hope one day to recoup, or whether you simply want to improve your living space. If your aim to make a profit over time, you need to do your research on the types of renovations that add the most value for the least outlay. Loft conversions and extensions can add up to 20 per cent in value. However, they can cost anything from £ 13,000 to £ 37,000, which means you might not make a profit when you sell. A new kitchen will typically cost about £ 20,000 but the value that it is likely to add varies between 5 and 20 percent. If you have a really dowdy kitchen, replacing it can make a big difference, but upgrading your kitchen when it is already good-quality is unlikely to make much of a difference to the property's value. Cheap cosmetic changes, such as redecorating, often give the biggest value boost relative to expense, typical costing about £ 1,500 but with the potential to increase a property's value by up to 12% (see also Abbey National's - nowadays Santander - survey results). DIY-renovations may seem to make money-saving sense, but if the finish is not up to scratch, you can damage your property's appeal. A recent survey of estate agents by the insurer LV= found that poorly executed DIY could lower a property's value by up to 5% and invalidate home insurance. Using professionals as part of a home improvement project may well be a good idea, the findings of a new study suggest. Santander Insurance found that, with families looking for ways to cut costs in the current economic climate, 72 per cent of people planning to undertake home improvement work intend to do it themselves. It quizzed respondents about their capabilities and 37 per cent said they were confident they could fit floor tiles, while 13 per cent even said they were happy to tackle bricklaying or concreting. However, the insurer estimated that DIY mishaps cause more than £330 million worth of damage a year in the UK. Santander Insurance UK's chief executive Miguel Sard said he understood why homeowners wanted to save money, but urged them to consider their limitations before embarking on any renovation work. "When it comes to the electrics of the house or major construction work, it is just not worth taking the risks. Get it done professionally," he added. Homeowners looking to install new floors may find that a flooring contractor is the best option for them. As well as fitting the new flooring, a good contractor will also provide advice on the best surfaces for the space. Giving a home a new look should be about expressing yourself and showing off your taste, according to one expert. Writing for Mercury News, interiors author Marni Jameson explained that while in the past people have decorated their homes in a bid to attract potential buyers, now the time has come for homeowners to indulge themselves. She explained that since many homeowners do not have a choice at present about whether or not they will move house, Ms Jameson said that they may as well make their home improvements for themselves alone. Recently, Anna-Marie DeSouza, editor at Build It, suggested that many homeowners will be buying big items in the coming days to beat the tax increase on January 4th 2011. And Phil Spencer (Location, Location, Location) advises homeowners to consider fitting wood floors. According to the television program host, installing wood floors can be a good way to make a home more attractive to property buyers. Wood floors are a particularly good choice for families, as they are easier to clean than other flooring materials. However, the property expert advised homeowners to carry out work now rather than waiting until just before they are ready to sell up and move on. "There is no point improving your home just before you sell. You might as well do the work straightaway if you can and get the benefit out of it yourself." Wood floors can be a popular choice for homeowners looking to add a defining feature to a room, as they are capable of adding character and warmth to any space. Herringbone patterns are set to become the next big thing in wooden flooring fashions. According to the designer Wendy Cole, wood floors are set to remain one of the most popular options for people redesigning their homes. "From a design standpoint, large herringbone patterns are replacing boards." However, anyone who does not like the herringbone look need not worry about getting left behind, as some styles of wood floors are timeless. "Linear strip wood remains a stalwart, as it gives the illusion of a larger, more open space," Ms Cole added. DIY expert Bridget Bodoano recently told the Guardian there are several affordable engineered wood flooring products available which could be suitable for people who want to install a herringbone-patterned floor in their home. Wood - what's not to like? eco-friendly, for every tree used in wooden flooring from sustained forests new trees are planted and trees are nature's way of absorbing carbon dioxide from the atmosphere and producing the oxygen we breathe. Having natural wooden flooring installed creates not only beauty, durability and an upgrade in the value of your property; it is also means you have a floor covering that is hygienic, anti-allergic and only needs the minimum of easy maintenance. Selecting the perfect natural wooden floor for your own home from all the different floor-types, wood-species and finishes available can be a daunting task. Some suppliers are more than willing to send you small samples, but these will never be able to show the full and varied character natural wooden flooring has. You could of course traverse to a selection of retailers to see what's on "show" in their showroom and try to remember which floor from which store you and/or your partner liked best. Architect, Interior Designer or Developer in need of wooden flooring? 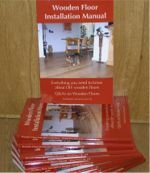 As the acknowledged authority on wooden flooring, many architects, interior designers and property developers, nationally and locally, frequently call 'Wood You Like' for advice on choice and suitability of different wooden flooring and advice on the fitting and maintenance (they see us as The National Helpline for wooden flooring) - and that expertise and professionalism is also always available to you too. As architect, interior designer or project developer you want to deal with those in the trade who know their business/trade, who have years of experience with all matters wooden flooring. You and we know of too many horror stories when projects go horribly wrong by so-called experts not taking the correct precautions or using unsuitable products, equipment. Vintage range, reduced in price! The Vintage Range: hand aged and hand scraped 15/4 wood-engineered authentic Oak floor, is absolutely and truly hefty reduced in price. Once again, simply a matter of dismissing the middle man. We are truly happy to inform you we can now supply you these authentic boards straight from the source in The Netherlands. Transform your home with authentic aged/scraped boards in no time at all. Order in time for Christmas, and orders over £1,500.00 ex VAT will be delivered for free in the whole of the South-East! Also available in load-bearing 20/6 floor in two grades: Rustic and Mill Run. Image above: Vintage 20/6, hand scraped, Oak Mill Run finished as follows: Brushed, Smoked, Black-washed and natural oiled. View all the available products in the authentic range at your leisure at home, simply request our Full Colour Online Wooden Floor Range Brochure, a new email with further details will whizz its way to your inbox within 5 - 10 minutes. Or give us a call on 01233 - 713725 now to discuss your requirements. Wood is a beautiful material to have within the home and people have been using it to create furniture or fittings for hundreds of years. There are so many varieties of wood to choose from and each one has its very own personal grain and colour. From the pale amber hues of beech or pine, through to far darker timbers such as oak or mahogany; there is a type of wood to blend in with any style of home. And it will even help to increase the value of your property. Now that we have so much technology around us, you may expect wooden furniture or fittings to be in far less demand than they once were. Surely modern homeowners are more inclined to fill their living spaces with chrome, acrylic or other contemporary materials? Well, this is not the case at all! It may be the twenty-first century, but many of us still choose to have wooden items in our homes; even wooden window fittings are a really popular choice. A lot of us may surround ourselves with cutting edge technology, but this has not made natural materials any less appealing to us; and you certainly cannot find a much more natural material than wood! By fitting wooden blinds at our windows, wooden floors or wooden fittings, we can have a nice modern living space that still retains a strong element of nature. We all know how long wood will last when it has been treated correctly and all wooden Venetian blinds have a special protective coating. This means that our window fittings will go on looking just great for many years to come! Because wood comes in so many different shades and patterns, it is suitable for any room in the home. This makes wooden blinds and wooden flooring extremely versatile, and allows them to blend in wonderfully with any of our other wooden fittings or furniture. Wooden Venetian blinds and wooden flooring are so much easier to clean than their fabric and carpet counterparts and, as a consequence, they will harbour far less dirt or bacteria. We are now even more aware of how important it is to keep our homes clean and wood provides us with a practical and attractive solution to this! Remember, according to WoodCare adding wooden features to your home will increase its value between 5 to 15%. From stripping down wooden banisters and exposing their natural character, adding wooden venetian blinds, re-instating real wood doors and installing real wooden floors in the main areas - it will all have an instant positive effect. Have you made your new year's resolutions yet? How about adding natural wooden flooring to your home - adding value and other benefits at the same time. To start this brand new year we are happy to announce 2 brand new range leaflets, filled with even more interior design picture to give you a better indication and view of how any of the quality products in these wooden flooring ranges could look in your home too. Duoplank and Solid Range - plenty of choices in Oak and Tropical wood-species. Wood is not only beautiful varied in all kind of products; as trees - forests - wood is a beautiful natural recreation source. Most importantly is the fact that forests act as a giant carbon sink. According to the International Panel on Climate Change, the 20th century was the warmest century since records began, with the '90s the warmest decade and every year we're adding 3.3 billion tonnes of greenhouse gasses into the atmosphere. The Government is now urgently looking to reduce CO2 emissions without compromising on economical growth. Right now the wood industry has a unique opportunity to take advantage of this commitment. The timber industry is able to offer positive contribution to the challenge of sustainable development and the reduction of greenhouse gas emission, and is more and more actively engaged with the building industry in putting new, environmentally friendly solutions into practice. The best way to grow our forests is to use them! 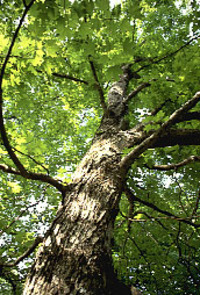 Trees are nature's way of absorbing carbon dioxide from the atmosphere and producing the oxygen we breathe. Planting trees can reduce the amount of carbon dioxide in the atmosphere and using wood products can help slow the growth of Global Warming. The more wood we use, the more our forests grow: thanks to sustainable forest management more trees are planted than are harvested - every year European forests grow by an area the size of Cyprus! Using wood in place of less environmentally-friendly materials makes sure the carbon sink effect of the forests is put to good use, rather than being lost through natural death and decay (when forests are left to their own devices this will cause CO2 emission from the stored carbon). Besides that, have you ever calculated the real environmental costs of producing steel, concrete, aluminium or PVC-U (energy used, CO2 produced, water used and toxins released)? Modern forests, skilfully managed, contain trees of different ages, different species alongside the primary production species. Open spaces in the form of rides, firebreaks and streamside reserves are designed into the forest and, as it is thinned, increasing numbers of under-storey species become established. While producing timber, these man-made forests also produce picnic spots, lakes and nature trails. Thousands of species of birds, animals and plants call them home. Their air is clean and good to breathe. The public has free access to 94% of forestland in Europe. Using tropical wood also helps in the fight against tropical deforestation, as long as the wood comes from well-managed sources. However, if there were no markets for wood, forests would be cleared to grow other cash crops. For these societies, often desperate for income, a forest that pays is a forest that stays. Wood You Like's tropical Duoplank comes from FSC certified forests. Every time you use wood you are helping to make sure the forests will keep growing. So your children and your children's children will be able to enjoy visiting forests for years and years to come. Here’s proof - that wooden flooring can add value to your home - with almost immediate effect. In a recent national survey (carried out by woodfloors.org) 90 % of real estate agents said that houses with wood flooring are more marketable, 58% agreed that homes with wooden floors sell for more money, and 46% agreed that homes with wooden floors sell more quickly than those without. Earlier this year we gifted, through the post, a little miracle of nature – a beautiful, locally handpicked, acorn to many of our contacts (perhaps even you). We hope they all have given it a honourable spot in their garden and that they will undoubtedly get many years of pleasure from this most magnificent of trees as it matures over the next 40 years. 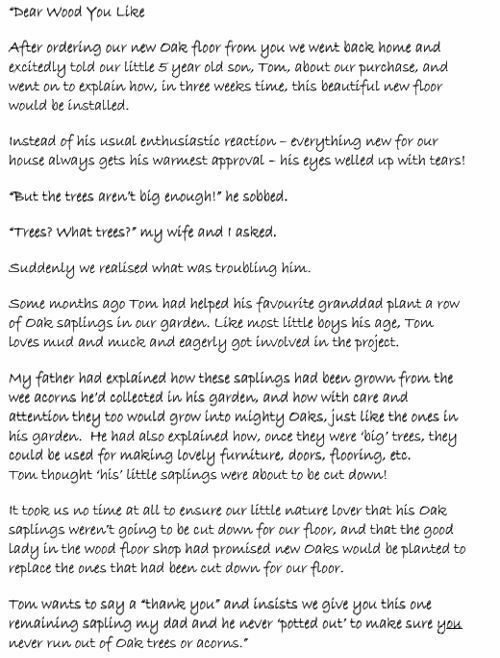 Now it’s time to share ‘the story’ behind our unusual gift. The letter goes on to thank us for the installation, but of course we gratefully accepted Tom’s gift (see picture right) and have given it a good home. All our wooden flooring, from Basic Oak to Bespoke, come from sustainable sources, be it FSC or PEFC certified. Thanks to sustainable forest management more trees are planted than are harvested. In fact, European re-forestation grows by an area the size of Cyprus every year! You can, just as our little nature-loving son of our client, rest assured that purchasing your wooden floor from Wood You Like will be an eco-friendly purchase – one with a delivery time of 4 weeks, not 40 years! Ps: all our clients who buy a natural wooden floor during our 5th Anniversary Celebrating year will receive our very popular ‘Walking with Wood’ comfy clog-style slippers – 1 pair for free for every purchase of 10 sq m or more. Wood You Like to get The Doors? When installing a wooden floor in any type of room there will be doors. At least one. Or seven in one hallway. Doors are not a problem - tick layers of paint on the hinges, now that's a problem. In our (Dutch) eyes the door frames are most times a small problem - no existing high enough wooden thresholds to bud the new floor against (leaving the needed expansion gap of course!) and a whole layer of wooden (or MDF) strips in various designs as architraves. But nothing proper tools can't handle to cut underneath or cut to the right new height required so the floor or flat beading slides underneath the door posts and a new solid threshold separates the room from others without the door scraping over it - or causing draft. All part of the daily job of a floor fitter. Well, wooden floor fitter that is. We stopped counting the times our clients ask us kindly to cut doors in completely different rooms or areas after a carpet fitter or tiler has finished his/her job without 'closing the door'. Apparently that's only a wooden floor fitter's common courtesy, getting the doors back in and having them work properly without damaging the new thresholds, floor or causing draft. On this blog and on our websites (Supply and Install 'division' - "DIY with a Difference" division) our aim to supply quality products and service is frequently mentioned. And we pride ourselves that our clients frequently acknowledge this fact by sending us testimonials and feedback. The personal and dedicated service you receive will continue for as long as you need us. 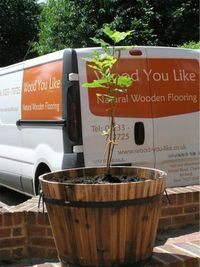 Our growing band of delighted clients, with their glowing testimonials and feed back are your confirmation and assurance of the quality and service you will receive of Wood You Like, THE natural wooden flooring specialists in the UK. Please advice. If needed Ton can come round later tomorrow (Saturday) afternoon. I will come back you on this. I may be able to get my father (who hung the doors) to replace the screws with longer ones if this is the case. I have a feeling that one of the doors may still need a trim but we'll try longer screws first - as we don't want them falling off in the long run. Can I take this opportunity to thank you and Ton for a fantastic job. The floors look superb and Ton has finished the fitting to a very high standard. My Father commented that it was a very tidy job - and as a carpenter he is hard to please!!! We appreciate your patience with our fussiness too - we can be awkward clients I am aware. Please feel free to use any of these comments on your customer comments section of your website etc if you wish. We are awaiting the news if replacing the short screws with longer ones has resolved the problem. If not, we're on our way - as promised. Shouldn't cork be boring brown? 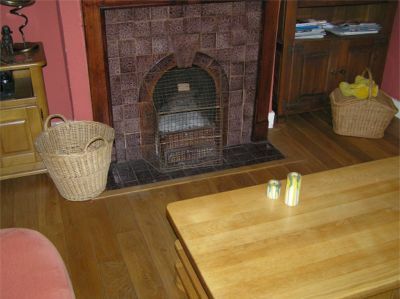 WicCork (Wicanders): "The Natural Choice for Environmental Floors" comes in many colours, designs and textures. The pictures above show only a small selection of all the colours nature's own insulator comes in, in total there are over 30 available (even brown). Go wild and create your own design mixing various colours and textures together; stay cool/calm and create your own 'hide-away' with one soothing colour. Cork, environmentally and eco-friendly harvested from the Cork Oak tree, absorbs sound and is warm, comfortable and soft under foot. Ideal hygienic and anti-allergic floorcovering in children's playrooms and bedrooms. Or to liven up your heavy traffic reception area, or waiting room and office. WicCork comes in floorboards (10.5 x 295 x 900mm) with corkloc T&G or in glue-down tiles (3.2 x 300 x 300mm/600 x 300mm) all with Extreme WRT (Wear-Resistant-Technology) finish and with built-in thermal insulation and built-in acoustic insulation (the natural characteristics of cork). In our showroom in Charing we have 24 large sample boards to give you the best starting point in visualising what/how cork floorcovering can do/mix with your unique interior design at home or in your office. Wood You like has been called upon to source wooden blocks for a restoration project in East Kent. The client needed herringbone blocks in a very specific width and length in order to fill in and extent from an existing herringbone floor, but was unable to find a exact duplicate until, of course, Wood You Like got involved. Our bespoke Design Parquet Manufacturer (named in the top 3 of "Best Supplier of the Year 2006" The Netherlands) made 'easy' work of the order and also created a perfect (left and right) tongue and groove to the 13.5mm thick solid blocks. Two weeks after the first enquiry from our client the wood blocks were delivered to site. Just one small sample of Wood You Like's specialities. House dust is the major cause of allergy in people with yearlong runny or blocked nose and/or sneezing. In addition to these allergic reactions, dust can trigger and irritate asthma and eczema. Allergies are the result of an overactive and over-performing immune system. There are many different types of allergies. Some allergies are genetic. If one of more parent suffers with eczema, asthma or allergies, it is more likely that any children will suffer one or more of these too. Some allergies are contact related and in order to have an allergic reaction you need to have had contact with the allergen. Eczema, asthma and hay fever (allergic rhinitis) are all considered forms of allergy. Almost all asthma in young people is allergic asthma. This means having inherited genes which makes it possible to get asthma; plus allergy-producing things in the environment, such as house dust mites, cats, or dogs; as 'trigger' factors. A speck of dust may contain fabric fibres, human skin, bacteria, animal danders, pollen, grains, moulds spores, food particles, mites and mites-droppings. Mites cannot be seen without a microscope. They thrive in warm and humid conditions. Because they feed on skin scales, they love bedding, carpets, upholstered furniture, clothing, closets and car seats. They usually survive ordinary vacuuming because they burrow deep and are equipped with sucking pads on their feet. Rigorous vacuuming every day can help to reduce the amount of mites; I don't know about you, but personally I find every vacuum cleaner 'smells' of dust, no matter how many times you empty the dust bag (one of the most tedious and dusty tasks around!) or change the filter. We use a soft-broom for day-to-day cleaning of our wooden floor covering, but that's a hard task on carpets we’re afraid. Carpets - they provide a breeding ground for mites. One square meter of carpet can contain up to 100.000 dust mites. However, the cheapest alternative smooth floorings are made of PVC, also known as vinyl, which is a major source of toxic and sometimes persistent substances in the environment. Some research also suggest the softeners in PVC itself may contribute to asthma incidence. These following tips are not only beneficial for people suffering from Asthma, eczema or allergies, they will have a healthy effect on all of us. It still amazes us that some people don't ventilate their rooms/homes just once a day for say only 5 - 10 minutes (even in Winter!). Opening a window for a small period of time will get rid of excessive moist, dust, tobacco and other 'bad' smells, and bring in some nice fresh air. Of course you can buy 'fresh-air' from a bottle/spray, but do we really want that? Fresh air from ventilation is FREE and will do your home and yourself a world of good. ICI Woodcare reports that adding/restoring natural wooden features in your home can increase the value of it. Wooden features include (stripped) wooden doors, door and window frames, wooden banisters on stair and landing, real wooden kitchen cupboards (or only cupboard doors) and of course installing Natural Wooden Flooring in the main areas. When deciding on Natural Wooden Flooring it's best to keep the most popular floor in mind, especially when you want to climb the 'property-ladder'. The most popular wood-type is still Oak and the grade mostly sold (in the UK) is Rustic. A Rustic Oak floor added to your home sells it better than for instance a tropical wood-type. Even if you would choose a specific coloured Oak floor (like Smoked, White-washed, Antique stained or Castle Grey oiled), the new owner can change this more easily to his/her own liking than trying to change a dark tropical floor into a lighter coloured one. Most customers (in the U.K. that is) find a premium grade Oak floor looks too 'neat' and resembles a Melamine (Plastic) Laminate floor too much. And an oil/wax finish is slowly gaining in popularity, matte replacing the gloss and shiny look. You can ask for a higher amount in rent because of the practical floor covering installed. Since more and more ‘affluent’ young people have increasing difficulties getting onto the property ladder themselves, but still want to live comfortable; putting a property for rent on the market with Natural Wooden Flooring can give you an edge over all other properties for rent. Buy-to-let is all about ROI (Return On Investment): how much do you spend on the property and how much does it bring in? In the first instance cheap carpet doesn’t look as much costs, but having to replace this (stained, smelly, ripped) carpet every year isn’t practical and will cost as much as having had Natural Wooden Flooring installed from the beginning, in the long run this constant replacing of ‘cheap’ carpet could cost even more. Tenants aren’t always as careful with your property/belongings as you self would be. The benefit of easy maintenance (and the ease with which small repairs can be done, especially with oiled finishes) you’ll have with Natural Wooden Flooring gives you more peace of mind in this matter. In fact it’s very simple: dirty is dirty, clean is clean. Because natural wooden flooring is a hard floor covering, dirt, dust will stay on top of it and will never penetrate the material (as happens with carpets). House mites have nothing to ‘cling’ on to. All it takes is a soft broom (or cylinder vacuum cleaner, we recommend the brand Miele – N.B upright cleaners with plastic wheels can easily scratch the floor) for the normal day-to-day care. Plus, taking care of your wooden floor enhances its beauty, durability and value. In our showroom we stock many maintenance products for any type of finish (waxed, oiled or lacquered) plus floor protection products like castors and self-adhesive felt pads in many shapes and sizes. We supply every customer with our maintenance leaflet, which contains more practical tips, and we can even carry out the maintenance service for you. You can even opt for our ‘Life-long’ price-guaranteed maintenance service, where we treat your floor minimum twice a year for a fixed price (including the maintenance product used), which will not change so long you live in the property the wooden floor is installed in.